Any rule against using a bottle neck case? About 1988 (age 22) I shot my first bullseye match at a local club event in Waxahachie, Texas. I used an 8.5" .357 Auto Mag. I believe the Class was simply "centerfire autoloader". No one cared what I was shooting until the scores were tallied up and then all hell broke loose. Because I won. The old man that won every month really got PO'd about it and claimd that bottle necked cases were not allowed. The whole group was still arguing about it when I left in disgust. I have never shot a Bullseye match since. Anyone recall the rule back in 1988? P.S. There is quite a difference in sight radius compared to a 1911 type pistol. Re: Any rule against using a bottle neck case? Well, I don't read, or remember, anything disallowing a bottleneck case for competition. Could this have been a club rule for indoor ranges? "Open sights may be adjustable but not over 10 inches apart measured from the apex of the rear sight to the apex of the front sight." It was an outdoor range. The sights are 12" apart on the Auto Mag, but no one mentioned that at the time. Just the "bottleneck" issue. If you shot this one handed...congratulations, you're ready for a quality ball gun and a run on "Distinguished". Yes, it was one-handed. I used to shoot pretty good in my early 20's even with the big bore magnum autos. 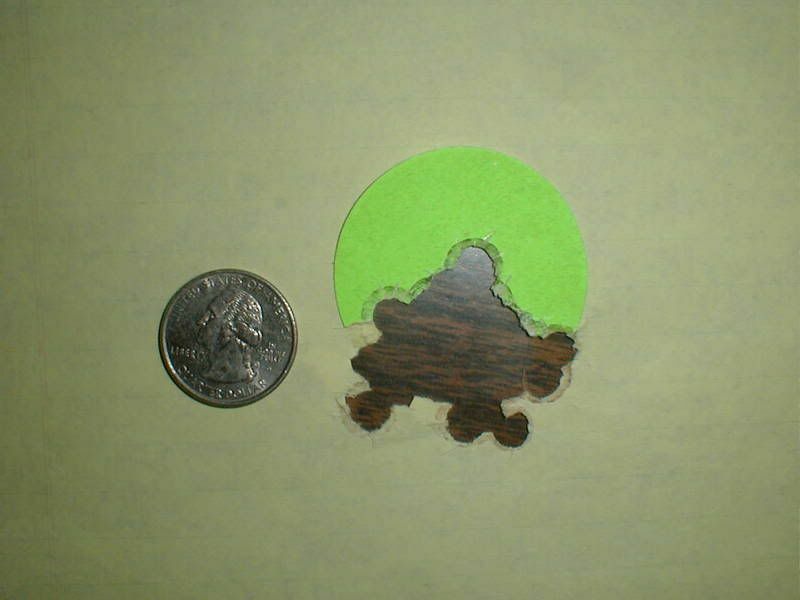 Here's a couple targets at 50 feet, hand held (2 hands), unsupported back in 1988. First is 7 rounds of 44AMP, 7 rounds of 41AMP, and 7 rounds of 357AMP all on the same Auto Mag frame. Second is five rounds of 41AMP.......I got a bit excited after the first four went into one little hole and then tossed the fifth one out. I know my Dad shot that oddball 38/45 for a wile in BE. does that count as bottle neck? Tony, I just have to ask, if you are such a great shot, why do you list yourself as just a "marksman"? It is not legal for use in the sport of bullseye; Not because of the ammo by the NRA, although a match director could disallow or allow certain calibers in his program. But for its barrel. If the guns barrel was 10'' or less you could use it for centerfire portion of a 2700, but being its 12'' it is illegal for use in any part of conventional (bullseye) pistol matches. standard safety features of the gun must operate properly. David is spot on. Now, if you could have a barrel that wasn't quite as long, you would be in business. BE Mike wrote: Tony, I just have to ask, if you are such a great shot, why do you list yourself as just a "marksman"? You mention "center fire autoloader" as the match. That doesn't sound like BE. BE matches are .22 & CF, 90 shots each for an 1800, or the most common, 2700's, .22, CF, & .45, 90 shots each. 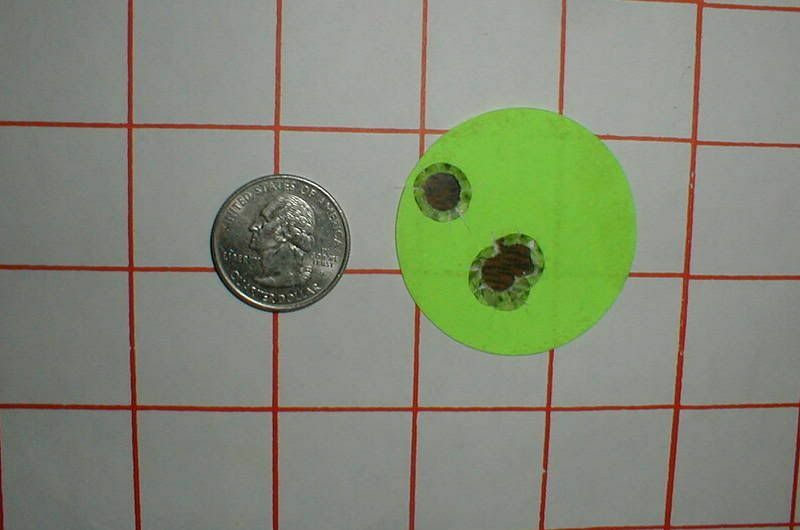 360 shots, needing 2 matches, are required for the NRA to issue a classification card such as marksman. If your memory is like mine, that amount of time can play tricks, possibly you shot a couple of matches or you attended another discipline held in conjunction w/ a BE match? At any rate you should develop your ability and shoot competitively! s1120 wrote: I know my Dad shot that oddball 38/45 for a wile in BE. does that count as bottle neck? A good friend & fellow BE shooter built a 38/45 but sold it soon after. I don't know why. He said the cartridge was developed for the CF match. The purpose was to get around the feeding problems of the .38 case in autoloaders. From that I assume it was in the earlier yrs of building the .38 special conversions. Do any of you whose experience reaches back into the 50's have information regarding this cartridge? Ya, Im not sure how long he shot it for. Had a lot of ammo left over, and the dies, and barrel laying around though. Its a strange looking round for sure! Please don't let that jerk keep on "winning" by keeping you away after 25 years. Go ahead and bring that AutoMag and shoot some not for record or classification scores, or bring/beg/borrow something that fits the rules. Betcha that pistol has a LOT of other fond memories for you. One of my earliest memories of a gun shop or the guns section of a hasmosteverything store was when I was maybe 4 years old. Was with my Dad, and while he was talking with the dude behind the counter, I had a nice close-up view of an AutoMag. Thought the stainless finish was cool, though I didn't have the vocabulary to call it that yet. Saw that day that the cool stuff is often behind glass.